In this video, Fab mixes a trio recorded live in real time conditions. This is a full mixing tutorial, top to bottom where the main challenge is to manage the bleed that has been captured in every microphone and the limitations of very close miking. This tutorial focuses on the limitations of handling every single track individually when a lot of bleed in involved, like concert recordings or full band recordings in one room, and shows you how to use bleed to your advantage. Done in Pro Tools, during the Audiodays seminar , the tutorial features the new Avid channel strip, Softube and Flux plug-ins. Fab also uses hardware from Tube-Tech PE 1C Equalizer, Tube-Tech CL 1B Compressor, and Dave Hill Design Titan Compressor. Will Knox gives a rousing rendition of his song "The ship and the storm" accompanied by drums, and cello. Hi guys! 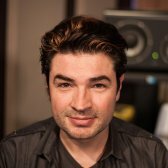 This session was organized by Audio Addict, Avid and pureMix. What I'm gonna do is try to explain to you my mixing process, with Pro Tools in this studio, which is not bad, actually, I'd be happy with this in my living room. The first thing I'm gonna explain is what the system is ... and how we're gonna work. We have a Pro Tools 10 HDX in the machine, so that's the basic system. Pro Tools 10 HDX, with the new card. We have the new HD I/O 16 channels, which sounds great. So that's the system we have. We are monitoring through a Dangerous Source, a new monitoring system. We come out of the Source, and we go into both Solo6. So that's the core of the system. I also have, on my left, a pair of Titans by Dave Hill, which are compressors that just came out, a Tube-Tech CL1B and a pair of PE1C EQs that I'm gonna use as inserts to show you how it works in Pro Tools with inserts in real time and delay compensated. I suggest we listen to the song so we have a point of reference, since some of you weren't here yesterday. The first thing I'm gonna do is organize my console to prepare for the future, and to do so, I'm gonna create two new tracks: an Aux track and a stereo track. I'm gonna put them at the end, to the right. I'm gonna put them in red so we can find them again easily. What I'm doing is preparing an Aux, here. And I'm assigning it to a bus, I take the output from the Aux and put it on bus 3-4 then I take the input of my final track and put it on bus 3-4 Next thing, I grab all my tracks here and assign them to the first bus: bus 1-2. So what's gonna happen now? Everything is gonna go into my first bus 1-2. So, it's gonna go into my Aux, right here, and the output of the Aux is gonna go into the track, which allows me - if I set my track to input monitoring mode - I can go anywhere I want in the song. I press Play So why do I bother to do that? Very good question ... thanks for asking. Actually, I'm doing that to insert plug-ins here, on my Aux I can insert compressors, EQs, maybe a meter, reverb, distortion, and I don't know what else. I can give a general flavor to the whole song, just with a couple of plug-ins or even hardware on this Aux. It's a master bus, exactly! 10 brownie points to you. It looks easier to do a "bounce to disk", and we can do that. But I like to keep full control of everything. For example, what I can do is a print of yesterday's rough mix, so we can listen to the song all together and mix business with a bit of pleasure. So I'm printing the rough. This is gonna be fun! So, the advantage here to having printed it is that now we can always check that we aren't heading off on a tangent. But, in principle, referencing is always good. The first thing I'm gonna do is try to listen to what's happening with the vocal. It's a bit closed up. He was very close so there wasn't much air. Let's try for example the new Channel Strip bundled with Pro Tools 10. First we're gonna filter the low end, that could be a good idea. So I increase the frequency and look for the place where it starts pruning too much, where some of the interesting bits start to get lost and I stop there. Let's go a little further on. It cleans up the bass drum's low end, so you can hear the boom of the bass drum, that's nice. It's going to avoid problems later on. I can hear a lot of issues. Since he was very close, "shhh" and "sss" are a nightmare. Gaël, from Flux, has just showed me this plug-in that has the incredible ability to compress a signal without relying on the level. If I try to compress this, the "shhh", for instance, then a compressor might not necessarily differentiate that energy from a different type of energy in the signal. And it's going to be difficult to tackle, to tell the compressor without using a whole lot of filters, that it should compress this particular bit. I know from experience that the "shhh" sound has a very high velocity. A much higher velocity than the rest of the signal. With this compressor, we can use the velocity instead of the level to compress. Let me show you. What I'm gonna do is locate, with the EQ, where the problem is. When it starts to hurt, then we're good. Now, this is unbearable, so it's perfect. Nearly there now ... Without. It's starting to come along. A bit more here. Good. Now we're going to listen to the 'sss' because the 'sss' are somewhere else. the Eiosys, which I really like. It's already much easier to listen to, it hurts a bit less. I think it's good, but it lacks a bit of ... substance, for reasons we saw during the recording. So I'm gonna add an insert I/O and I'm gonna put the CL1B there. So, what happens now is that it looks like I added a plug-in but actually, not at all, I added the CL1B. and all of this with delay compensation. Everything remains totally in phase. Isn't it wonderful? So that means for instance that all the machines that you only use for recording because it's a mess afterward to insert during the mix, if they're all connected properly on the same input and output, then you can use them as plug-ins. That's kind of cool. I do that all the time, So let's see what we can do for Will with the CL1B Tube-Tech compressor. So we need to try to give a certain density and a more pleasant twist to it. Maybe less than that, Interesting. Ok that's too much, we can hear it. I'm gonna turn the ratio down a little. meter, in terms of frequencies and listen to the difference in the voice's pitch, with and without the compressor. So we have this, and this. We're going to start out flat. Can you hear the difference better? Let's have a survey: Who thinks it's too much? Who thinks it's just right? I think it's too much. It's a matter of choice here. On this album, I think it would be bad taste to leave it like that. I have a ratio around ... 11 o'clock so it's probably 4:1, something like that. I have a threshold of -10 My attack is very fast and my release very slow. My idea was to level it all out a bit, to keep it constantly there, but I failed, that's not what it did. It goes boom. So, what do I do to change it? That's the question. If I want that sound but less sensitive, I increase the threshold there will be less happening. I'll show you. This is the threshold we're at. and with less threshold, it compresses less, we can hear it more, but on the other hand, it gives me less of the effect I want. So let's say that maybe, by chance, I had picked the right level. I like where it starts compressing but it's compressing too much. Agreed? So my option is to change the ratio. I can attenuate less every time the voice goes over the threshold. So if I decrease the ratio, There's nothing written on it, so let' say 3:1. So, you've heard the difference here when he says "I'll be the shipwreck", it doesn't go boom. It's a lot more reasonable. It's manageable. Let's not forget that we're listening to the vocal by itself. It's going to be completely different with the rest of the music, especially with the phase of everything bleeding into everything else. But, in principle, that's already less barbaric. I can turn my ratio back around to where it was at 4:1, and slow down the attack. Because when he says: "I'll be ... the shipwreck", I can decide to slow down the attack, so it takes more time for the compressor to do its job, which would give less attenuation and would not be so audible. At that point, we need to ask ourselves: "Which one do we like best?" It's a matter of taste, but also a matter of dynamics So, let's say, that's where we were before. And here, I open the attack. But on the other hand, if I do that ... when he says: "Break me down piece by piece" it's starting to shift in an unpleasant way. Can you hear that, at the back of the room, too? More or less? OK.
So,let's get a consensus. I personally think I liked it better with the attack closed, as it made it very fast. With a smaller ratio so it's not that obvious. So, let's check that we haven't messed it up. I left the Release all the way up. my original intention was to make a kind of static compression where the compressor is always on but we don't hear it much. Interesting detail, there's no point in spending hours focusing on the voice because when we start to remove the solo and look somewhere else, everything is going to change anyway. So ... you've got to start somewhere. So I'm going to create two new Aux tracks by using the automatic thingy they've just added, which is actually quite cool. and then I'm going to create another one called "rev longue" for "long". I have no imagination. I take both of these reverbs, I put them here I shouldn't forget, obviously, Speaking of which, it would be a good idea to name it. I'm going to call this one SUM and this one PRINT so we can't mix them up. Generally I set the Aux to yellow. That way, I know when I look at my session, I see right away, without thinking, that at the bottom ... here they are. Well here we have 6 tracks, but when we have 192 tracks, it's handy to have a color scheme, that's always the same thing. So we're gonna use two small reverbs. Why two reverbs? Because it's quite handy to recreate some space around an instrument. what I'm gonna do with the Flux:: reverb here is I'm gonna switch off what we call the Church-type reverb, but I'm going to use it for the early reflections to try to create some space wrapped around the singer and around the rest of the instruments. So I use a short reverb for that, and a long one to blend everything together. So we have a space, and a blend. As a reminder, the dry sound is like this. This kind of recording is boring, especially for this kind of music. It's crazy, isn't it? It sounds like a real room. I might just open it up a bit, create a slightly bigger room. And now I'm gonna do the long reverb. I'm looking for an atmosphere that's gonna add some color – this is Softube's new reverb – some kind of general coloration that I like for the song. I like to think of the short reverb as the tool to use to create this space. So if the singer is here, and the long reverb to fill up the space between the notes as well as create some height. And we can actually do that with just a small reverb here. It's a bit long, we can hear it a lot. I don't like it, so let's shorten it. It's too much. But it's nice. We're going to adjust the level of the reverb with the rest of the music, but I like the space it creates. and we came from there. So with these two colors, I'm going to be able to choose the space of the mix a bit. as it will never be by itself. So let's listen to the guitar with the vocals. Nice ... I'm going to use the Channel Strip here. So, what I'm interested in here again is to remove some of the low end. You'll notice that here, I'm going to EQ the guitar, by listening to both the guitar and the vocal, because the phase relationship between the two mics is very important. 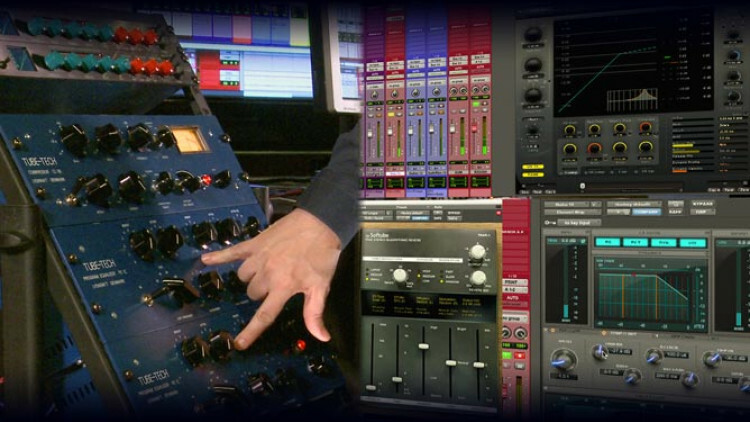 When you start using EQs and filters, it changes the phase relationship. It's not just moving the mict hat changes it ... everything changes the phase relationship. That's where it gets both hellish and fun. It's probably a bad idea to start changing those kind of things without listening to the mic that will be most influenced by it, which is the vocal mic. The low end of the vocal should change when I start making changes on the guitar. I'm going to lower the high end a bit because it's a bit bright. So I'm going to lower that a bit, as I have enough in the vocals mic anyway. So, I have two filters, that I lower like so ... you can see that there. we can hear the guitar well and everything ... I might just compress it a bit. This one's the new plug-in bundled with Pro Tools 10, that's the Euphonix's Channel Strip. Their compressor has this real interesting feature, which is a compression limiter. don't compress by more than 4dB". Even if, with the settings, I'm telling you that you're supposed to compress by 20 dB, you're not allowed to. It's real convenient because it allows you to make a kind of thing that keeps it together. I think it's an interesting little thing. We're only listening to the guitar here. Can you hear it? This one is quite loud. Nice. With the vocal now. I think we've made some progress. Let's put a bit of reverb on the guitar, just because we can. It's starting to sound like a record, a little bit. I've got my vocals, I'm not necessarily 100% happy with it, but it' not bad. If it was a record with a bass drum that goes boom, or a bass that goes boom, then if I have decided that it's the kind of color that I need for this record, it's the moment when, usually, I use my 2bus processing, that is, my EQ or compressor, on the 2bus. I use it right from the start. The idea behind it is that you can mix the entire mix by hearing a bit how it's going to sound in the end, especially if you're going to send it to a mastering engineer that's going to turn it into a pancake. In my experience, in the last few years, if you're planning to make a record that's going to be the loudest in the world, you have to mix in a compressor, or even in a limiter. Because if you don't, it will be impossible to make it the loudest record in the world. So I'm going to put a 2bus processing in order to add a color to the song. And also because, since everybody is playing together, I'd like to have as much glue as I can. I showed you the inserts earlier on, I'm gonna do the same here: take an I/O here and use the Titan which is a new compressor by Dave Hill. I'm going to play around a bit. A bit, just for a laugh, we'll see. You'll notice that it helps me a bit on the peaks, that's nice. We're going to leave it as it is for now. It's nice, 1 or 2 dB ... Let's not go crazy. Another thing I'm going to do, I'm gonna put the Tube-Tech EQs, I'm gonna put the PE1C that is the two EQs here,r and I'm going to use them because I like the sound of transformers on this. It gives a real nice sound, so that's going to let me give it some color. It's a bit softer, it's nice. I'm going to open up the high end, around 16K, just to see what it's like. Just to show you: it's right here. Did you hear the difference? Let's go back now to normal levels, and forget the caricature. Great, and I'm sure it could use a bit more in the low end. As a reminder, without the hardware inserts, it sounded like this. bring the level up a bit. So let's see where we're at. There's not enough level yet of the Elyxir, because we are a civilized bunch, we work at normal levels. But as soon as I add the drums and the rest, it's gonna go boom. So, we're going to keep it like this for now. Let's take a look at the drums. This is our bass drum, which is very big. So I'm listening to the bass drum through my processing on the 2Bus. It was 200, not 100. There's also something around 60. There we go, 55 Hz, precisely. It's difficult to talk about sound, and about frequencies in music, it's really hard. Everyone uses their own metaphors. Many people make a connection with the human body. That is, there's a top that is going on over the head, and something rather nasal happening around 400-500, and then the harmonics of all that, below. So if we manage, after a while, to create some kind of analogy, it's also really convenient to be able to remember it. For example when I heard that, I knew straight away that it was 60 Hz, straight away. feeling the music, and understanding the feelings that each frequency gives me. There, I knew straight away that it was 60 Hz. So, without the EQ. I'm going to show you the frequency this one, and I'm attenuating it a little. It's not gonna change the world, but it's convenient and it sounds nicer. Let's take a look at our overheads. I recorded it with two separate tracks. I'm going to create a stereo track. Now I'm going to get rid of these two here. If you look at it, I'm using the HDX. Plenty of leeway, right? Should be fine. We shouldn't have DSP issues today. I put a mic above the snare drum and one above the cymbals, and actually ... I wish I hadn't. It's a bit too wide, so I'm going to get a bit more detail, a bit more focus on the drums. Actually, I wanted to spread the drums across the stereo field I wanted to do this. But given where we were, I didn't really have a choice. So it's a little too close for me, it's not dreamy enough. Let's see what it sounds like with the vocal . Now, I'm gonna create a group with the drums – what's drums in French again? - I'm gonna call it "d". I really want to put some reverb on the bass drum. I know we're not supposed to, but who cares? Let's use ... this one. That would be fun, though. A bit less, but a bit longer. Nice. All the drums together now. It fills in the gaps a bit. Before, it was going a bit boom, whereas here, it's a bit more boooooom. I like it. Let's see. Maybe we'll regret it later on. Let's have a go with the cello now. I'm gonna create a bus to handle the cello as just one track, instead of having two separate tracks. Let's not forget to send it to the SUM That's good, they all bled into the cello's mic. Let's see if it screws everything up ... or not. Let's add an EQ on this, just to see what it does. Actually, what I would like is to show the wooden aspect, the "real instrument" vibe, to highlight it as much as possible. Even if it's ugly by itself, it's gonna allow me to put the track at a lower level and control the bleed. and that I lower the very high end, like this. Let's see ... by itself it'll be awful. If you listen to the snare drum, the difference in the snare sound is quite big when you add the cello. That's flat. Instead of having this coarse feel here, like a snare drum recorded from a distance in a room, and that is not necessarily pleasant to listen to for this song now we have less of this. It's a small sacrifice for the cello, but actually ... it's not that bad. And we get some of the presence of the snare drum back, which is nice. Let's put some reverb on it, it's a string instrument so we need reverb. I've got this real urge to put the bass drum very loud. I'm resisting but it's hard ... OK, let's do it. I like that, because actually, in the headphones, when I do that, it gives this kind of effect of having the bass drum underneath the vocal, and at the front. So instead of having everything flat and compressed, there's some kind of depth. And since the bass drum mainly gives info from the low end, then if I put it loud and forward, there's no masking effect with the vocal. It gives this 3D effect that's very pleasant. So, let's go to the moment in the song where it's going to get complicated. Because until now, it was pretty simple. I already regret turning up the bass drum. That's what we call "a great big mess". I've got this huge urge to use the ribbon mic on the guitar. We don't need the low end. So let's try to make this a little less coarse too. I'm gonna try and get rid of the masking effect at around 200 that we heard straight away, remove some of the very low end to get rid of the bass drum. I'm not gonna touch the high end, because it comes from the other mic. there's still a mask here. it's gonna let the condenser go down and leave the ribbon at the front automatically, without me having to do anything. That's the vocal track here, which is ruining my life right now. What I'm gonna do is go right in and dig a hole in it with the automation. We have to be careful toward the end, because he starts singing again straight away. Maybe it would be nice to have the boom here. Now we're going to entertain people a bit by turning up the cello. If you want to draw automations without editing points, on Pro Tools 10 you can select the region, like this. So, the advantage of the clip gain, since it can seem obscure. Why bother with the clip gain When you have a fader? Clip gain comes in before the plug-ins, so, for example, if you have a singer who has a really loud note just before your compressor, as we saw earlier on, there could be one note that disturbs and overloads the compressor. we split it, and turn it down with clip gain without altering the compressor's settings. We can put a compressor for the whole track that sounds good, and we can modify the 2 or 3 notes that bother us with clip gain. It's really handy, and there's a feature to convert clip gain into automation, and the other way round, which is also very convenient. Let's hear it from the start. I started to listen to the song, that's a good sign. I don't know about you, but I started to forget we were mixing the song, and started to get lost in it. It means we're on the right track. I stopped it, sorry, it was just a side comment. Same spot, compared to the rough mix. depth that wasn't there before. The vocal doesn't hurt anymore, It's a bit too compressed so I'm going to lower that a bit. A bit less compression here, maybe lower the threshold, because I like the vocal to go boom, at the front, loud. He's the one telling the story, not the bass drum. In songs where the bass drum is the one telling the story, I put a lot of bass drum. What else? I think we've pretty much covered it. Let's see the difference, at the point where the song starts to soar. There, at the end, the vocal is a bit buried by the rest... But I like it actually. At the emotional level, it did something for me. and I like to keep a bit of that in there. We can fix it and clean it, but as soon as you start removing the emotion, it's not great. So I created the new playlist and I press record. Talent, sensibilité, émotion, tout est la, magnifique, merci Fab ! I really enjoyed this one. Maybe because it was the style of music I play, but it dealt with problems that I have face in the studio. i love you FAB ! This is a great example of the phrase "Less is More". Great job, you guys make it look so simple. Yes. Subtitles only work for Flash Player => not iOS.